If you are not sure which of our vintage tyres you need please read the section below. This will give help with tyre and rim types and sizes and also a discussion of the history and various types of vintage tyres and rims that are available. Also included are some of the different methods of describing the same vintage tyre sizes. 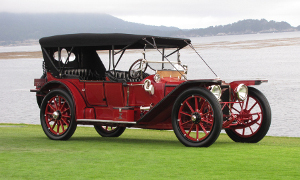 Prior to 1924, in the veteran and vintage car period, the majority of European car manufacturers fitted wheels for use with beaded edge vintage car tyres, and some car manufacturers continued to do so after this date. Beaded edge veteran and vintage car tyres have large circumferential ridges of hard rubber (beads). These beads fit into the hook (clincher) of the vintage car wheel rim. A minimum tyre pressure of 60psi is needed to push the beads into the clincher of the rim and keep the vintage car tyres in place. The most common cause of a beaded edge vintage car tyre failure is lack of pressure allowing the car tyre to detach itself. Beaded edge vintage car tyres can only be used with a beaded edge wheel rim. Beaded edge vintage car tyres were succeeded by safer wired-on vintage car tyres in and around 1924 in Europe and slightly earlier in America. Within the bead a solid wire ensures that the tyre's bead circumference cannot stretch and will always be smaller than the external circumference of the car wheel rim. Wired-on vintage car tyres can be used with the wheel types discussed below. The split-rim was very popular with American manufacturers such as Packard, Dodge and Buick and was also used on Rolls Royce Silver Ghosts built in the U.S.A. From prior to World War One until the late 20's this style of rim enabled manufacturers to utilise and gain experience of wired-on vintage tyres before the general acceptance of the well-base rim. The split-rim incorporates a rim which is detachable from a wooden wheel. The rim is cut through, and when removed from the wheel, can be drawn inside itself reducing its circumference and allowing the tyre to be removed and refitted. These rims have various locking mechanisms which prevent the rim collapsing during normal use. Lucas are now making an excellent range of straight sided vintage tyres. Another style of rim that was very popular with the American market ,and in the mid twenties some European manufacturers. The straight-sided rim has a detachable flange on one side, when this is removed the tyre can be slipped on to the rim and the flange replaced. This style of rim can still be found on some heavy goods vehicles today. The well-base wheel has, as the name suggests, a depression in the centre of the rim and is used only with wired-on tyres. 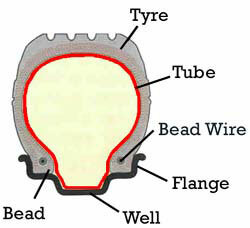 To facilitate fitment part of the bead of the tyre must be pushed into this well before the rest of the tyre can be worked over the flange. The technique for fitment is similar to that of a standard bicycle tyre. 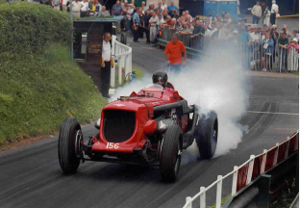 Initially there were worries that tyres may detach themselves from well-base rims when deflated, however a test involving an Alvis being driven in tight circles with flat rear tyres proved that such worries were unfounded. This type of rim became commonplace on cars in the mid 1920's but was originally conceived for bicycle tyres in 1890. Michelin, aware of the concerns over tyres detaching themselves, pursued the design of a rim with a well for only half its circumference. 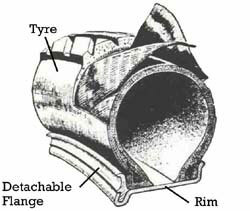 However as the well-base wheel proved its integrity and its design was refined the bibendum rim was discontinued. Tyre dimensions for these bibendum rims are predominantly given in metric terms rather than the more commonplace imperial measurements used for well-base wheels. The invention of the TRX by Michelin in 1973 was the first instance of tyre and rim being designed to work together as a single unit. The new Michelin TRX rim was designed with a lower, flatter flange than that of conventional rims . The bead of the Michelin TRX tyre was also altered to suit this new rim design and the result is a more gradual curvature of the tyre sidewall giving exceptional directional stability and 'on the limit' handling, whilst also allowing for a comfortable ride. Michelin also designed the TDX rim which again can only be fitted with a purpose built TDX tyre. The TDX rim has two grooves running circumferentially around the bead seats and the tyres have specially extended bead toes which are held in place by the grooves. 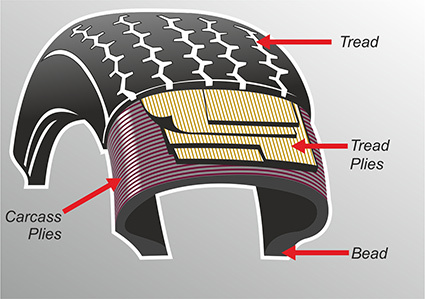 The purpose of this is to prevent the tyre leaving the rim thus giving the tyre a limited 'run-on' capability allowing control of the car to be maintained in the event of a deflation, and a safe place to be reached for it to be changed. These Michelin TRX tyres and rims were standard fitment on many performance cars of the seventies, eighties and early nineties, such as Ferrari, BMW, Renault Alpine, Alfa Romeo, Peugeot and Renault 5 Turbo. The cross-ply vintage tyre is made up of superimposed layers of textile cord running at alternate angles from bead to bead. With this design the sidewalls and tread are not differentiated and this gives the tyre structure great rigidity. With a cross-ply vintage tyre the maximum width and the height of the tyre above the rim are approximately equal. This relationship is known as the aspect ratio and with cross-ply tyres is approximately 100%, giving the cross-ply tyre its unique "tall" appearance. The beauty of the radial design is that it separates the functions of the sidewall and crown of the tyre, allowing greater vertical flexibility whilst ensuring that there is still as much surface in contact with the road as possible. 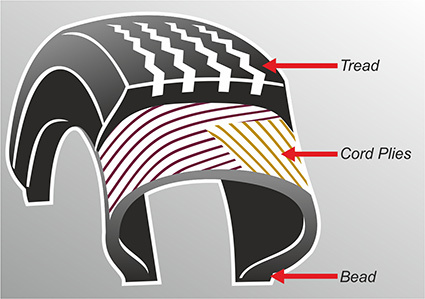 In radial classic tyres the sidewall has a one or two layers of textile cord giving good flexibility, and the tread is made rigid by combining the casing layer with two (or more) layers of steel cord bracing plies. Both these factors give the radial classic tyre excellent road holding capabilities and a longer life span when compared to vintage cross-ply tyres. All measurement systems refer to two or more of these dimensions, but there are several different traditions of expressing tyre and wheel size.  The oldest tradition of expressing tyre size gives the diameter of the tyre, followed by the height of the tyre section. For example, 33x5 describes a tyre with a diameter of 33 inches and a section height of 5 inches. To calculate the rim size, double the section height and take it away from the overall diameter of the tyre. A 33x5 tyre fits a rim diameter of 23 inches. In the majority of post-1924 vintage tyre descriptions, the last number is the rim size. For example, 600x16 and 185R16 both describe tyres for a rim diameter of 16 inches. Michelin also produced some tyres and rims with a metric measurement, for example vintage cross-ply 14x45 (measured in centimetres) & classic radial 155R400 (measured in millimetres). In both cases the last figure is the rim size. The measurements for beaded edge tyres are given as the diameter of the tyre X the height of the tyre section in millimetres. For example, 760X90 describes a tyre with a diameter of 760mm and a section height of 90mm (to fit a 580mm rim). Some manufacturers gave the measurements in inches. For example, 31X4 describes a tyre with a diameter of 31 inches and a section height of 4 inches (to fit a 23 inch rim). The measurements for tyres used on straight-sided and split rim wheels are given as the diameter of the tyre X the height of the tyre section in inches. For example, 33X5 describes a tyre with a diameter of 33 inches and a section height of 5 inches (to fit a 23 inch rim). The measurements for crossply tyres are given as the height of the tyre section and the width of the tyre (one measurement refers to both dimensions) x the diameter of the tyre in inches. For example, 5.00x21 describes a tyre with a diameter of 31 inches and a section height and width of 5 inches (to fit a 21 inch rim). Occasionally measurements for crossply tyres were given as the diameter of the tyre X the height of the tyre section in inches (as for beaded edge, straight-sided and split rim tyre measurements). Commonly today, tyre manufacturers do not have the demand to warrant making all tyre sizes. Crossply tyre measurements such as 5.00/5.25x16 indicate that one tyre has been produced to fulfil original fitments of tyres with 5 and 5 1/4 inch section heights (to fit a 16 inch rim). The measurements for crossply tyres may be given in centimetres. For example, 14x45 describes a tyre with a diameter of 73cm and a section height and width of 14cm (to fit a 45cm rim). Crossply tyre measurements such as 12/13/14x45 indicate that one tyre has been produced to fulfil original fitments of tyres with 12, 13 and 14cm section heights (to fit a 45cm rim). Aspect ratios began to be reduced at the end of the 1960s to improve cornering. Previously no aspect ratio was given on radial tyres; and in these cases an aspect ratio of 80% should be assumed. For example, 185VR16 describes a tyre with a diameter of 602.4mm, a section height of 148mm and a width of 185mm (to fit a 16 inch rim and with a speed rating of V). Where the rim size is a three figure number, the measurement has been given in millimetres. For example, 280/45VR415 describes a tyre to fit a 415mm rim. The following table indicates rough correspondence between alternative notations for radial tyre sizes. Speed ratings for radial tyres are given below. New speed ratings are currently being developed to subdivide the Z rating. Radial classic tyres often bear a load index, indicating the maximum safe load for the tyre. Several notations for radial tyre sizes are in common usage. For example, although the technically correct notation for a radial tyre may be 135SR15, the size may be referred to as 135x15, or 135 15, or 135R15. The table below shows alternative notations for all available radial tyre sizes.